ONCE YOU HAVE YOUR MEASUREMENTS YOU CAN GO TO THE HOW TO ORDER PAGE FOR SIZES AND MATCH UP YOUR MEASUREMENTS. THESE ARE SOME OF THE MOLD SIZES WE HAVE WHICH ARE NOT CUSTOM SIZES. PLEASE CAN CALL US TO ORDER THE ITEM. 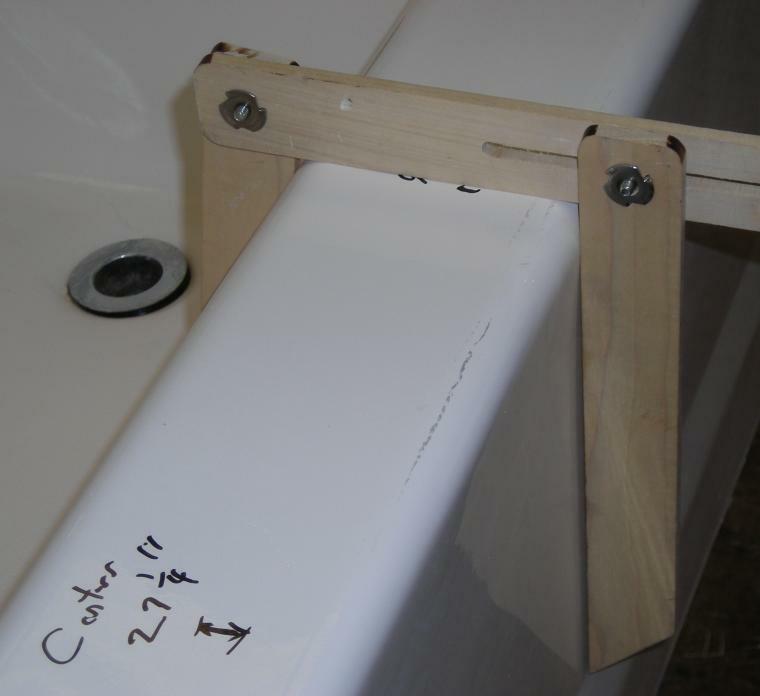 Step 1 Place your straight edge tool on the inside of the tub to determine if the tub has a curved inside or is a straight tub. 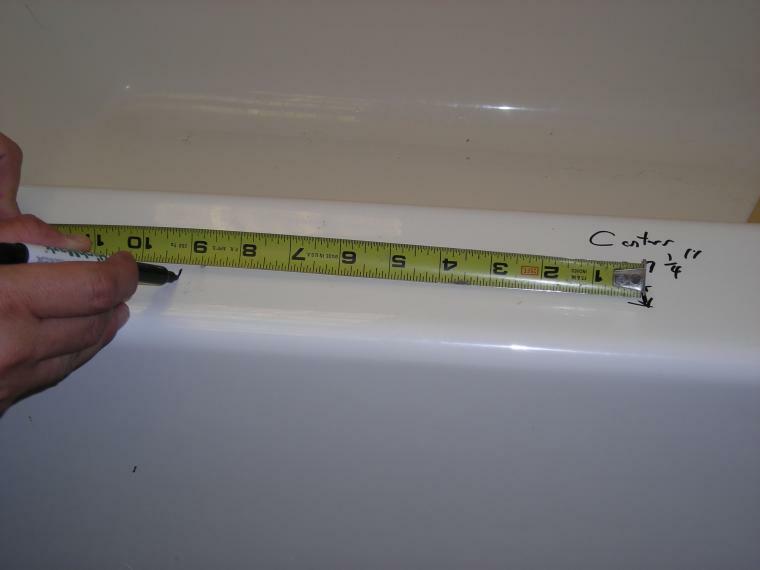 Step 2: Find the center of the tub by measuring the inside of tub (not wall to wall) and mark the tub at center with a non permanent marker. 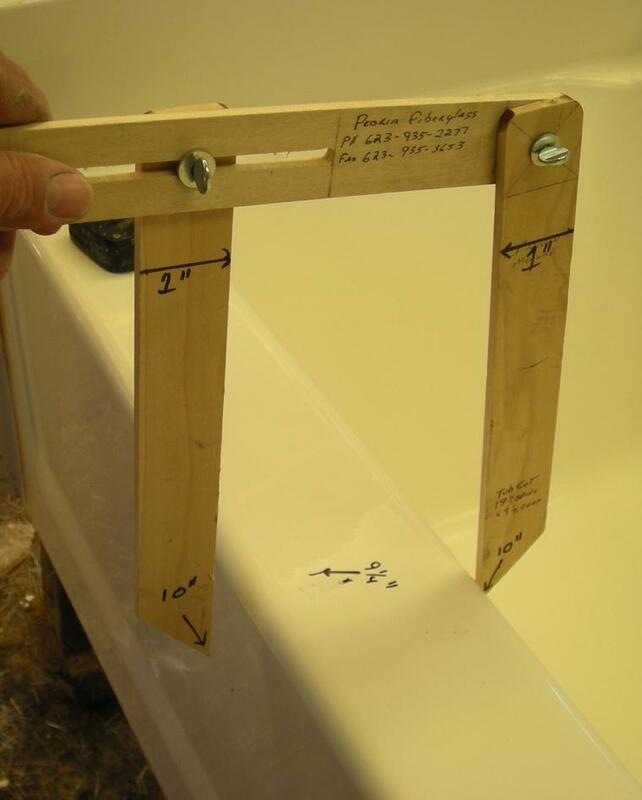 Step 3: Measure 9" from the center mark out to the right and mark tub. Or 12" from center if 24" opening. Step 6: Tighten clamp on measuring tool and remove from tub without moving the arms of the tool. Your tool may look different from this picture if you use clamps as in instructions. 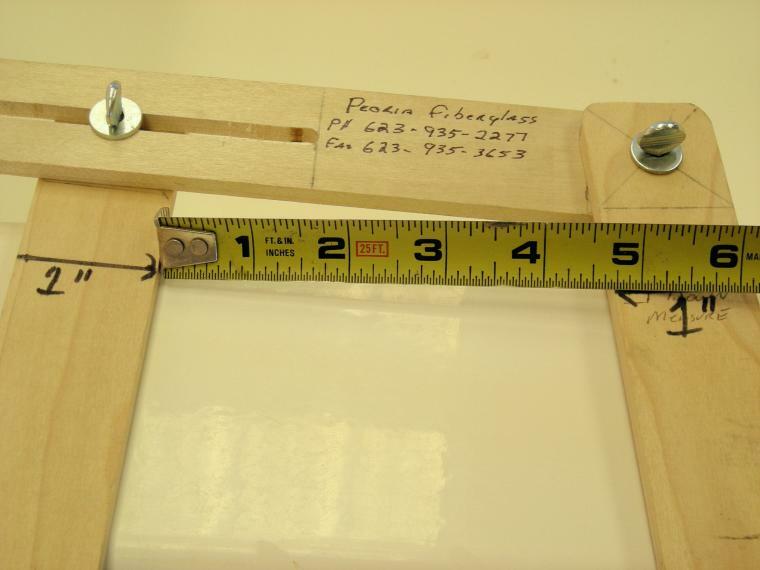 Step 7: Measure the width of the tool at 1" down mark on tool and write this measurement on a piece of paper. 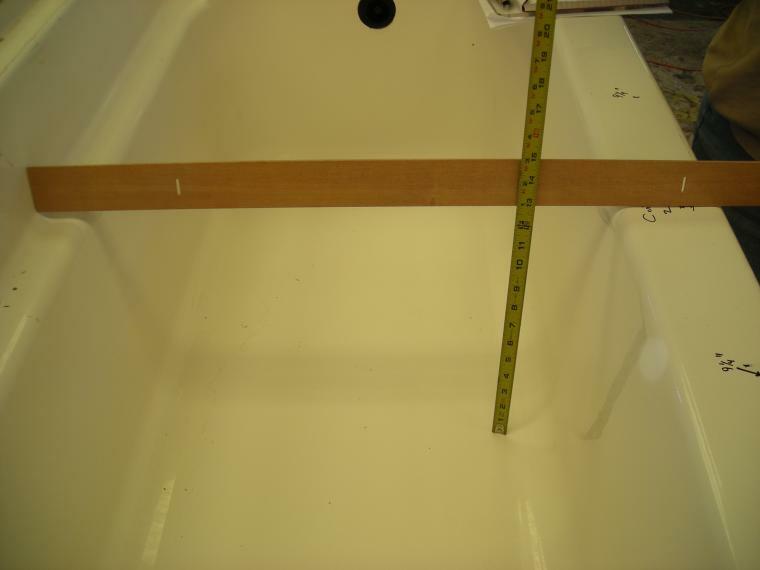 Step 9: Take a yard stick and place across tub as shown, then measure the depth of the tub from the bottom of the stick to bottom of the tub. Write depth measurement on paper. If depth is less than 10" call for further instructions. 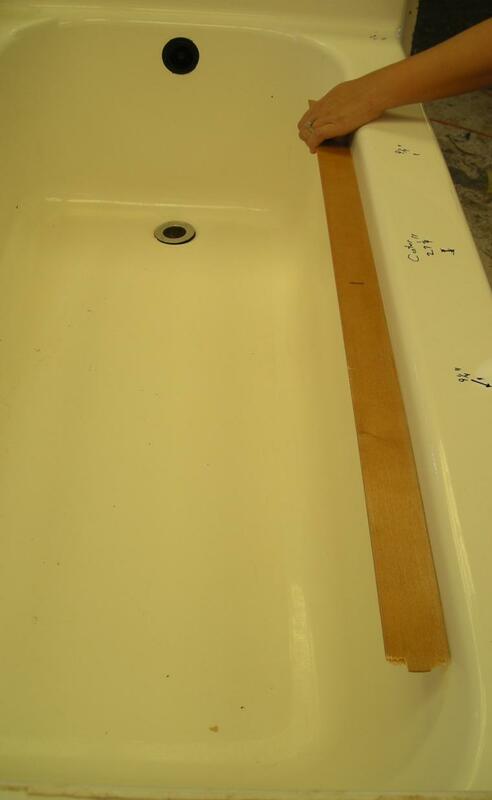 Step 10: Repeat measurements on tub at 9" left and 9" right of center mark. If tub is straight then all 3 measurements will be the same, if curved inside tub then the 2 side measurements should be almost identical but will be different from center measurement. 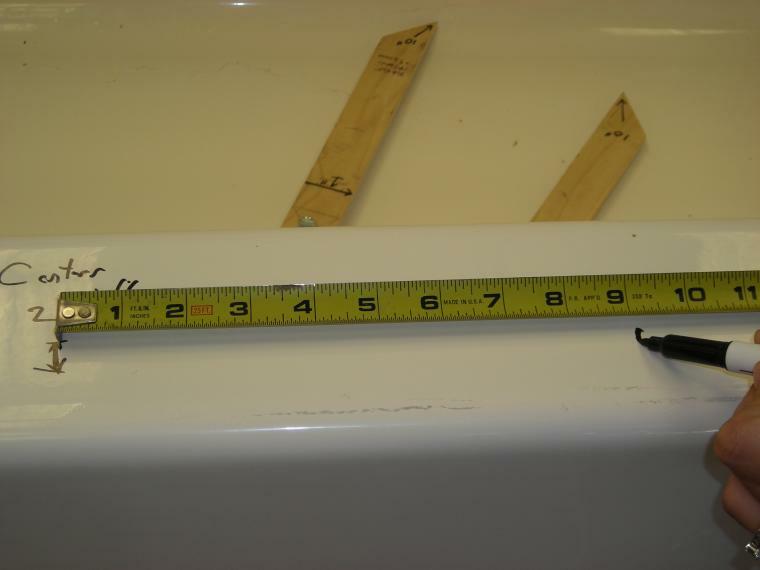 Some tubs have one side wider than the other, if so indicate different measurements and if it is on left or right side of center. Step 11: If your bathtub is not straight up and down on the outside of bathtub then we need to know what that angle is. 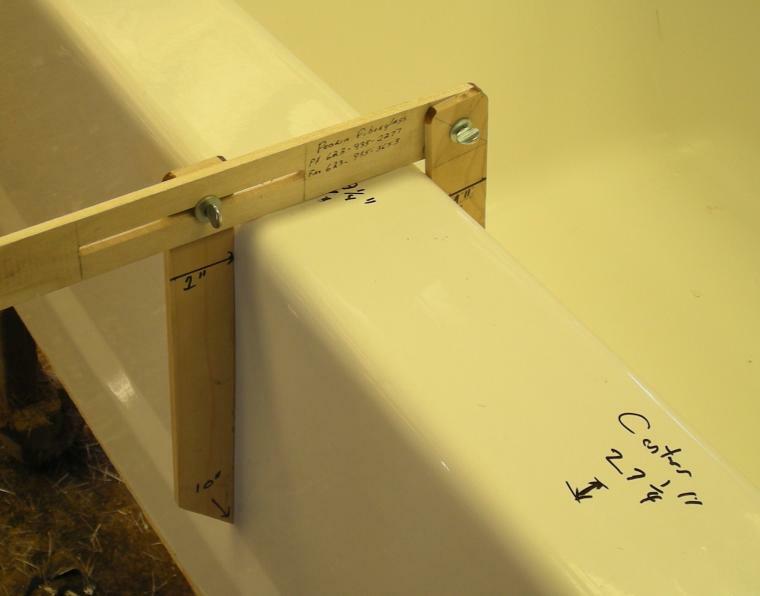 You need to put a straight vertical with the front face of bathtub and measure how far out from the bathtub that the straight edge is, and let us know ho high the front of bathtub is. We will determine the slope. If you have pictures you would like to send to us you can fax or email them. Pictures and as many measurements you can provide as possible will help us to manufacture your product. Step 11 : You can then call me at 623-935-2277 or email your measurement to us as peoriafiberglass@cox.net and we will get back to you with any questions we may have and a time frame for shipment. ONCE YOU HAVE YOUR MEASUREMENTS YOU CAN GO TO THE HOW TO ORDER PAGE FOR SIZES AND MATCH UP YOUR MEASUREMENS. THESE ARE SOME OF THE MOLD SIZES WE HAVE WHICH ARE NOT CUSTOM SIZES. NOTE: CUSTOM PARTS ARE NON REFUNDABLE. BE SURE TO GET ACCURATE MEASUREMENTS PRIOR TO ORDERING. IF YOU ORDER WRONG SIZE WE CAN FIX IT FOR AN ADDITIONAL FEE, BUT WE WILL NOT GIVE A REFUND. Click on a gallery picture to enlarge it.